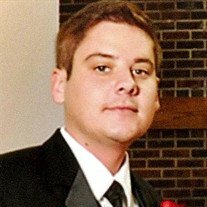 Kyle James Marciniak of Amherst, Oh and formerly from DeWitt, MI, age 34, passed away unexpectedly on May 22, 2018. He was a 2002 graduate of DeWitt High School. Kyle attended Michigan State University and was a highly skilled computer technician. He was an outdoor lover of skiing, hunting, hiking, camping and canoeing on the Looking Glass River. His genuinely kind heart, fierce mind and brave spirit will always remain with us. Surviving is the love of his life Samantha Fritz; his parents Kenneth and Karen Marciniak; sister, Krista Fielder; brother-in-law, Brian Fielder; nephew, Andrew Fielder; loving aunts, uncles, cousins as well as members of Samantha's family. He also had a circle of very close friends. Kyle will always be missed and forever in our hearts. Those desiring to make contributions in Kyle's honer may do so to Safe Haven Ministries or the American Cancer Society.